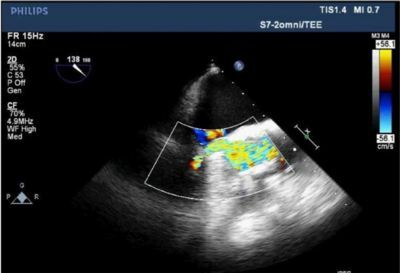 56-year-old male with severe AS, severe COPD, Crohn’s Disease on immunosuppression, HTN and non-obstructive CAD presented for TAVR procedure under MAC sedation. 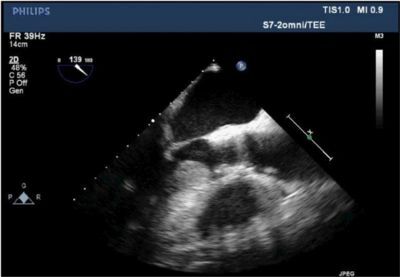 Following successful deployment of the transcatheter valve and cessation of rapid ventricular pacing at 180 bpm, the patientremained hypotensive, tachycardic, and short of breath. Due to prolonged, severe hypotension post-deployment, escalating doses of intravenous vasopressors were administered. The patient continued to decompensate into acute pulmonary edema requiring oral suctioning and RSI intubation. Given his refractory deterioration caused by rapid pacing and poor response to epinephrine, an LVOT obstruction was high on our differential. Consequently, inotropic medications were ceased, and rate-control and afterload increasing medications (esmolol, phenylephrine) were prioritized with marked improvement in symptoms. 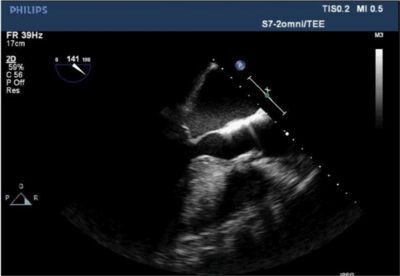 The expedited intraoperative TEE assessment confirmed the presence of a previously undiscovered (masked by the severe AS) hypertrophic cardiomyopathy pathology causing LVOT obstruction with SAM. We initiated longer-acting beta blockade with metoprolol, a phenylephrine infusion, and begun judicious fluid administration to achieve euvolemia guided by TEE. This resulted in a significant improvement of gradients (peakgradient of 25 mmHG, mean of 13 mmHG). The patient was transported to the ICU intubated and paralyzed with stable vital signs, normal ABG, no external pacing, and improving respiratory status. Patient was mechanically ventilated, sedated, and remained on a phenylephrine infusion until POD #1 when he was responsive and nodding appropriately. He was converted to a vasopressin infusion and continued to receive beta blocking agents. 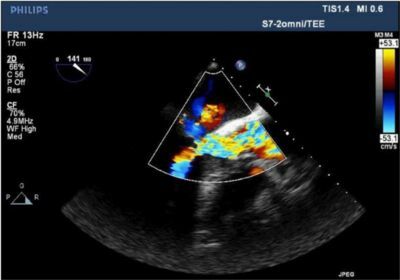 A repeat TTE showed moderate to severe concentric LVH, normal LV systolic function, EF of 60%, a normally functioning prosthetic valve with peak gradient of 27 mmHg and mean systolic gradient of 10 mmHg. An overlying LVOT gradient of 40 mmHg that was late peaking was also observed. The patient continued to be weaned from vasopressor medications and was extubated on POD #2. On POD#4, he was ambulatory, moved to the ward and was discharged on POD #5. Post-discharge, the patient’s medical management of his subvalvular HOCM was closely monitored; this is anticipated to improve with further ventricular remodeling.